The words we use can open doors to understanding, respect, dignity and support for people to lead the lives they want. Words can also create barriers, stigma or stereotypes that are demeaning and rob people of their individuality. 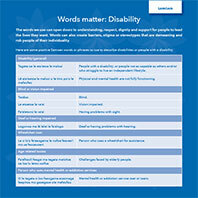 Find out about positive Samoan, Tongan and Cook Island words or phrases to use to describe disabilities or people with a disability, and a reminder about negative words which should be avoided. To download a directory of general information, services and community support available for people who have a disability and their families, visit the Your Guide to Disability Support Services page. These guides are available in seven different languages.